Web of WMN | Listen Free on Castbox. 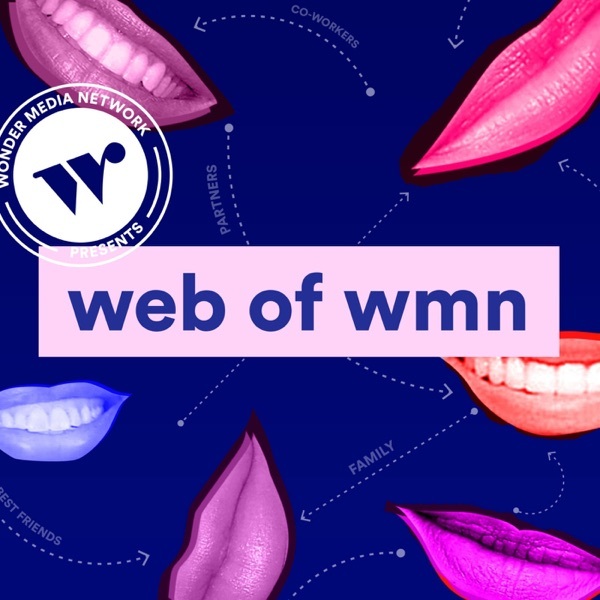 Welcome to Web of WMN, Wonder Media Network's new show that dives into the identities and relationships that form who we are as individuals and communities. Have you ever stopped to think about all the people you know? And all the people they know? Each of us has a rich community of connections. It forms a bustling, complicated, interconnected web. Welcome to Web of WMN, Wonder Media Network's brand new show. Host Jenny Kaplan launches four interview chains by picking four women she knows from different parts of her life. They talk identity, politics, gender, religion and more. Then each of those women picks someone to interview. Subscribe and stay tuned!Special thanks to Overcoats for the tunes and Ben Broer for audio editing expertise! This season of Web of WMN is exclusively sponsored by Skype, a Microsoft product. Welcome to Web of WMN, the show that dives into the identities that make us who we are as individuals and communities. On this very first episode, Host Jenny Kaplan interviews one of her closest friends, Sosie Bacon. They talk about Sosie’s evolving career goals, her political perspective, and how she got radical about body politics. This episode launches the first of four interview chains this season. Stay tuned next week for the second chain and check out Episode 5 for the next link in Sosie’s web. Special thanks to Overcoats for the tunes and Ben Broer for audio editing expertise!This season of Web of WMN is exclusively sponsored by Skype, a Microsoft product. On acting, privilege, & body politics. Welcome to Web of WMN, the show that dives into the identities that make us who we are as individuals and communities. On this episode, Host Jenny Kaplan interviews one of her closest friends from work, Jing Cao. They talk about Jing’s immigration from China, her experience growing up in a diverse bubble, and what happened when that bubble popped. This episode launches the second of four interview chains this season. Stay tuned next week for the third chain and check out Episode 6 for more from Jing. Special thanks to Overcoats for the tunes and Ben Broer for audio editing expertise!This season of Web of WMN is exclusively sponsored by Skype, a Microsoft product. On building community, immigration, & civic education. Welcome to Web of WMN, the show that dives into the identities that make us who we are as individuals and communities. On this episode, Host Jenny Kaplan interviews a former colleague many levels her senior, former Businessweek Editor-in-Chief Megan Murphy. They talk about growing up in John Hughes’ hometown, how coming out changed Megan’s personal mission, and the important politics of everyday people. This episode launches the third of four interview chains this season. Stay tuned next week for the fourth chain and check out Episode 7 for more from Megan. Special thanks to Overcoats for the tunes and Ben Broer for audio editing expertise!This season of Web of WMN is exclusively sponsored by Skype, a Microsoft product. On coming out, everyday politics, & letting men go. Welcome to Web of WMN, the show that dives into the identities that make us who we are as individuals and communities. On this episode Host Jenny Kaplan interviews a new connection, DeNora Getachew, the New York City executive director of Generation Citizen. They talk about growing up in New York, getting pregnant in high school, and developing into a full-blown democracy ninja. This episode launches the fourth and final interview chain this season. Stay tuned next week for the second link in the first chain and check out Episode 8 for more from DeNora. Special thanks to Overcoats for the tunes and Ben Broer for audio editing expertise!This season of Web of WMN is exclusively sponsored by Skype, a Microsoft product. Welcome to Web of WMN, the show that dives into the identities that make us who we are as individuals and communities. This episode marks the first foray into the second link of an interview chain, ft. Sosie Bacon and Kyra Sedgwick. Welcome to Web of WMN, the show that dives into the identities that make us who we are as individuals and communities. This episode is the second link of the second interview chain, ft. Jing Cao and Danielle Guillen. Welcome to Web of WMN, the show that dives into the identities that make us who we are as individuals and communities. This episode is the second link of the third interview chain, ft. Megan Murphy and Hilary Rosen. Today we have a special surprise for you! Check out this first look at Wonder Media Network’s brand new show, The Brown Girls Guide to Politics, hosted by A’shanti Gholar. The next episode of the Web will be released tomorrow morning. In the meantime, we hope you enjoy this trailer and that you subscribe to The Brown Girls Guide wherever you listen! Introducing: The Brown Girls Guide to Politics! Welcome to Web of WMN, the show that dives into the identities that make us who we are as individuals and communities. This episode is the second link of the final interview chain, ft. DeNora Getachew and Glynda Carr.